Provides invisible cushioning (transparent and discreet). 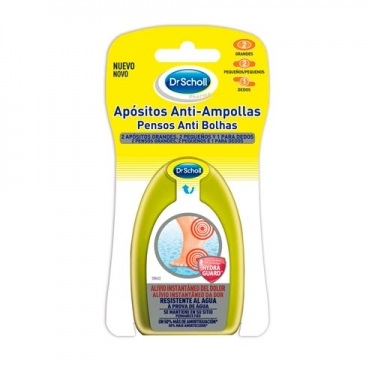 DESCRIPTION: Blister Treatment from Dr. Scholl are thin, transparent, bubble-protective dressings that are indicated to protect the bubble from friction, keeping it hydrated and flexible. It has 3 different sizes: 2 large bandages, 2 small bandages and 1 bandage for fingers. Provides advanced bubble protection thanks to revolutionary double layer Hydra-Guard technology. The stiffer outer surface of the protective disk protects the bubble from friction and friction. The soft gel surface provides cushioning and accelerates the regeneration process, keeping the bubble hydrated and flexible. The dressings do not move and are waterproof. Remove film # 2 using the blue tab and carefully apply the adhesive part of the dressing to the skin.